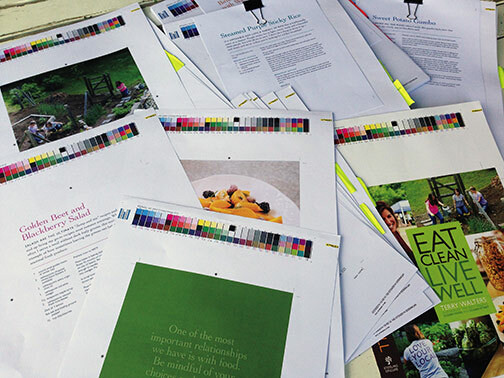 I’ve been buried in the stacks of printer’s proofs of Eat Clean Live Well (ECLW) this past week and am bleary-eyed as a result. Well… what’s new is my book! That’s right. Eat Clean Live Well is now officially available for preorder! And if that doesn’t make this latest adventure real, nothing does! So if you’re starting to think about new clean food recipes for the fall, how you’re going to preserve the harvest, delving into lacto fermentation and so much more, now you can preorder ECLW and look forward to it arriving on your doorstep hot off the press! And if you’re just as excited to share it with friends and family as I am to share it with YOU, then you may want to take care of your holiday gift-giving at the same time! As always, eat clean and live well! I want to thank you for inspiring me at our Encore Group! I’m going to be using your books as a bible when I start my new body cleanse and diet. I do have 2 questions though for you. What is that teff flour and where can you get it? I never saw that before. Also, can that flour replace regular flour in other recipes that call for regular flour? I have some gluten free books, but many recipes call for a lot of butter and sugar. I guess that makes up for what’s missing, but they are deliciouc. I would like to be able to make them even healthier and still taste as good. Than you again! I will be buying more of your books as gifts. Thank you for sharing your Encore community with me, Ann. What a great morning at the library! To answer your questions, Teff is a high-protein, non-gluten grain that has a somewhat nutty taste and smooth texture. I am a big fan and use is in my baked goods, as you’ll see once you dive into my recipes. Because it does not contain gluten, you won’t be able to substitute it (or any other non-gluten grain) 1:1 for regular flour. You will, however, find in my books a variety of baked goods that are not only free of gluten, sugar and butter, but are satisfying and delicious. Remember…focus on bringing new clean foods in, and soon the old foods that didn’t serve you fall to a healthier place in the mix or end up disappearing altogether. I’m sure you’ll have more questions, and now you know where to find me!